The Nintendo 64 version of GoldenEye 007 doesn't hold up according to the producer of the upcoming Wii remake. GoldenEye 007 was basically 1997's console equivalent of Call of Duty, with it offering an incredibly fun first-person shooter experience, but does it hold up thirteen years later? Julian Widdows, executive producer of the GoldenEye 007 remake coming to the Wii in November, doesn't think so. "Let's put it this way: I wouldn't go back to play it again," he told Edge magazine. 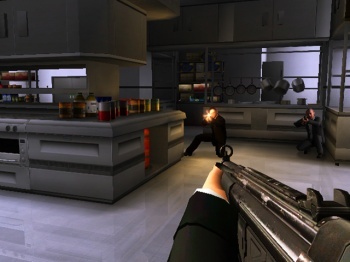 Widdows says that bringing GoldenEye 007 back in 2010 for the Wii took more than replicating the same levels and gameplay from the N64 classic. He explains: "It was a case of saying, 'Okay, what can't come forwards? What doesn't stand the test of time?' The narrative doesn't really stand the test of time in its purest form; it does feel very '90s." Eurocom and Activision had to update the Wii version of GoldenEye to reflect Daniel Craig as the new James Bond, and to make it closer to what modern gamers expect from a first-person shooter as far as gameplay and environments go. I hate to agree, because GoldenEye 007 for the N64 was a ton of fun, but it really has taken a hit like most N64 titles for some reason. Gameplay feels slow, the levels look empty, and the story was mostly told through dossier text. Not that it matters, because GoldenEye provided a multiplayer mode that gamers sunk thousands of hours into, and single-player became a sandbox when mixing cheats. Invincibility mode combined with infinite rockets was the only true way to play through the story. Despite Widdows not thinking GoldenEye holds up today, he does say: "It's still a great game and I think structurally it still has things that contemporary games tend not to have." He's got "fond memories" and doesn't want to look back on the game negatively. I say that as long as Eurocom models a bungee cord onto Bond's legs at the end of the first level, which I'm pretty sure Rare forgot to do, I'll be happy.